San Francisco became the first major city in California to implement all of its planned 15-MPH school zones, the SFMTA announced today. With proper enforcement, the measure promises make the streets surrounding 181 schools safer and more inviting for students and parents walking and biking. 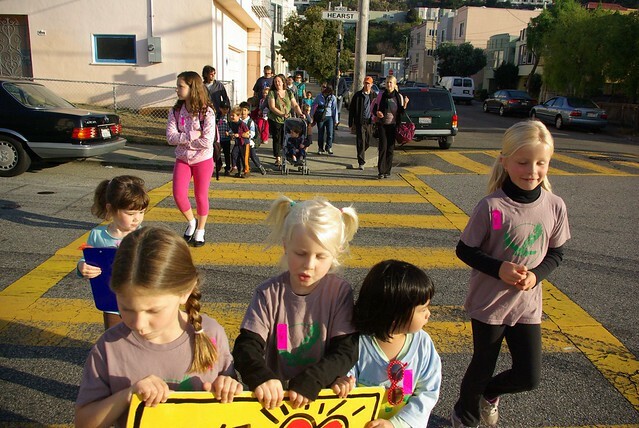 The SFMTA began installing 15 MPH speed limit signs at schools in August. Although the agency originally estimated the zones would go in at around 200 private and public K-12 schools, only 181 “are eligible under a 2008 state law which allows the 15-mph zones on two-lane streets for 500 feet around a school,” reads an SFMTA statement. Captain Denis F. O’Leary, head of the SFPD Traffic Company, said police are out enforcing the signs. How about 15mph speed limits in ALL residential areas of the city? They put the signs up but the cars still fly up and down Cole St ..
And not just when children are present. 20 is plenty. I would call SFPD on their non-emergency number ( 553-0123). Ask for them to enforce the new speed limit on that street, particularly since you are observing violations. The police will respond if they have phone logs that indicate people were complaining about speed limit violations. What about zones near senior citizens’ residence? They get injured as easily as children. Do we not care about the elders in SF? Twice I have assisted seniors cross King/4th St.
Good luck getting anything done at 4th/King, that’s car’s land there! Great job WalkSF for paving the way for safer streets for our kids! Now on to more enforcement of the rules, traffic calming, and beyond. At this point, I think you can only specifically get a 25 mph zone near senior centers.